At long last, the day has arrived! 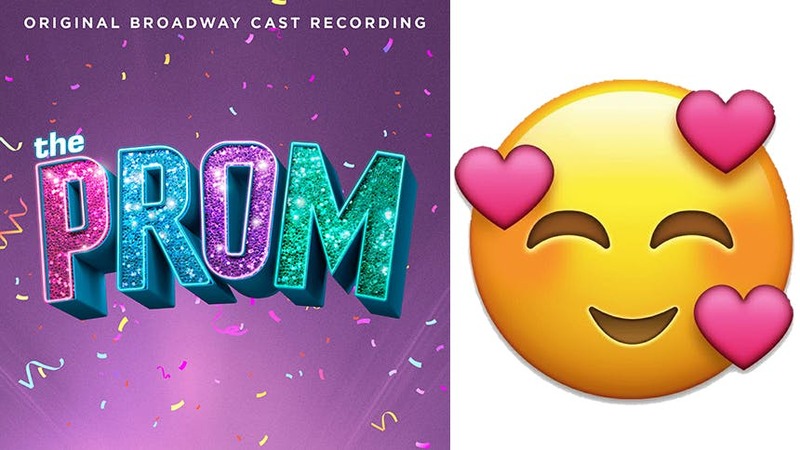 The original cast recording of the new Broadway hit The Prom is finally available for download from Sony Masterworks Broadway, and it's absolutely epic. Below, BroadwayBox reacts in animated GIF to hearing each track for the first time. The first 30 seconds already has you dancing in your seat—some deep shoulder action. Beth Leavel is a TREASURE! I love how inside baseball this song is as the opening night reviews pour in and the tension around it. This song cracks me up, but, warning, it’s heavy on the jokes against conservative Middle America. So, if that’s not your thing, just skip this one. I really like Caitlin’s voice. I can’t wait for the many, many cast recording that will include it. I also can imagine countless girls in high school singing this at auditions, cabaret nights, etc. We are not worthy of Tony Award winner Beth Leavel. She is a queen of musical theatre belting, as you can hear here. Not since “Stumble Along” have I loved her on a track this much. Also Chad Beguelin’s lyrics are genius. It’s time for the love song. Settle back and let it wash over you. It’s so sweet. I love Caitlin’s big ending too. Get it, girl! This feels like a skip song, TBH. It’s amazing onstage, the lyrics are great, but it’s like “Inutil” in In the Heights Disc 1, you don’t need it for future listens to feel complete. Meanwhile this song is a total bop. I was dancing at my desk much like this GIF, honestly. Then it takes it to the next level when Caitlin and Isabelle come together at 2:06. This is a nice character song, and quite relatable to theatre fans. It’s beautiful. Weirdly, I like this moment more on the album than I did onstage. OMG, end of Act 1 already? THIS SONG IS EVERYTHING. If you only have time for one song so far, it should be this one. This is getting added to my important, most-often played playlists. It’s impossible to stay still during it. I truly hope this is their Best Musical Tony number because it’s amazing onstage and should be preserved. I have embraced the word zazz in such a major way since seeing this show that I know people around me are already tired of it. This song is absolute perfection. Just on repeat ‘till I know every word and inflection. Oh my, right from “Zazz” into “The Lady’s Improving”?! I don’t know if my gay heart can take it. This number is one of my favorite moments in any show from the fall season. Your favorite could never. These three Drag Race GIFs capture the four-part journey I went on during this number. This score better get its due come awards season. This song could be such a saving grace for young people who feel trapped by religious views on homosexuality. Also, is the choice to use the verb trumps in repeated phrase “love thy neighbor trumps them all” a lil shade to the prez? I adore this song. It’s so heartbreaking without being a traditional theatre ballad—Chad’s lyrics are devastating but Matthew Sklar’s music still feels optimistic (maybe for Alyssa’s future?). Also, Isabelle sounds so damn good on it. Another song you can expect to make the rounds at high schools and colleges. Why isn’t Brooks in everything? He’s such a singular talent. He is giving you those good Songs for a New World vocals paired with his Tony-nominated brand of comedy. And this song is another beyond toe-tapper. “I Am What I Am”, “Ring Of Keys”, “Unruly Heart”—all top-tier gay Broadway anthems. It’s an instant classic. This song gives you a little greatest hits flavor. A pretty perfect finale number. This GIF is me when anyone in proximity to me says even the word prom. A great album to a fun, feel-good show. I’ll have it on repeat all Christmas break. Get yourself over to ’The Prom’ at Broadway’s Longacre Theatre ASAP and download the album today.